Fuyuki is an anti-terrorism specialist for a security company. 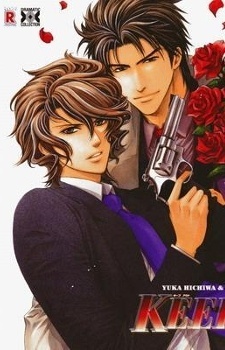 His current assignment is as a bodyguard for elite company president Kagami. This is no ordinary assignment, however. Kagami’s not looking for protection from Fuyuki, he’s looking for love, and his constant expressions of affection have Kagami’s nerves stretched to the breaking point. Note: the last chapter is in novel form. It actually does happen. I did not believe it was possible. But it is. This manga is so beautifully drawn that I really paid no heed to the story or the characters. The ethereal beauty of Kisaragi Hirotaka's art made everything else just fade away into insignificance. Frankly, I don't know what the story is like, because I did not care. I suppose it's mediocre, because it did not disrupt the visual pleasure. It might even be good. Same goes with the characters. i was swept away by the beauty emanating from each page, I did not even stop to think about psychological development or about the plausibility of the relationships. Keep Out is an eye candy, if there ever was one.